I made this flower birthday cake for a 5-year old. 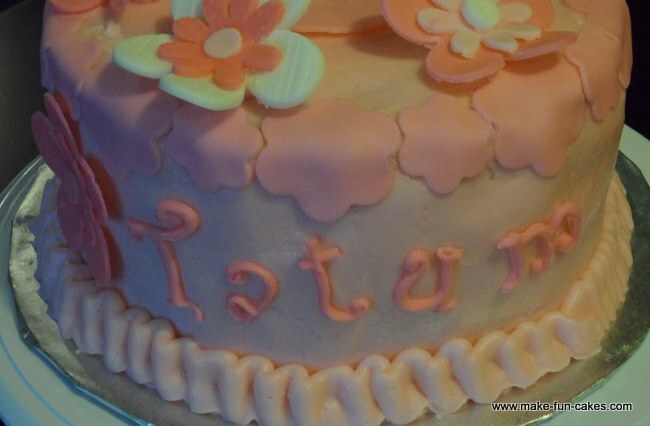 It is an easy cake idea with fondant flowers and letters and a ruffle border. I was pleased with the results and she was too. 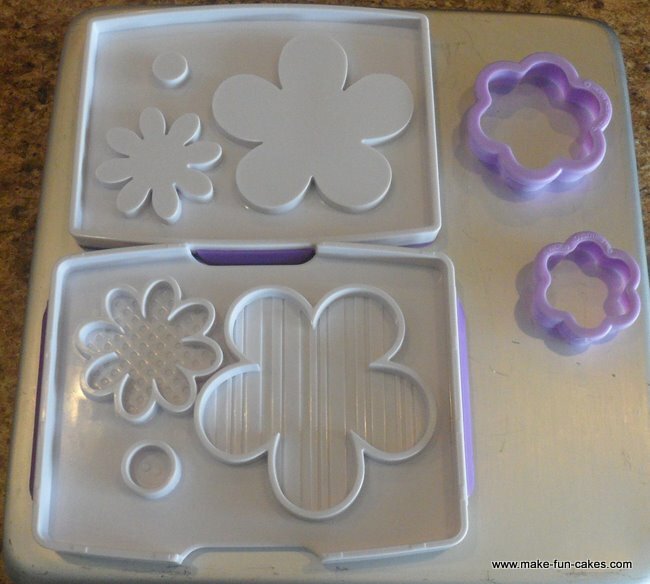 Make main fondant flower decorations a few days before you bake the cake and allow them to dry. 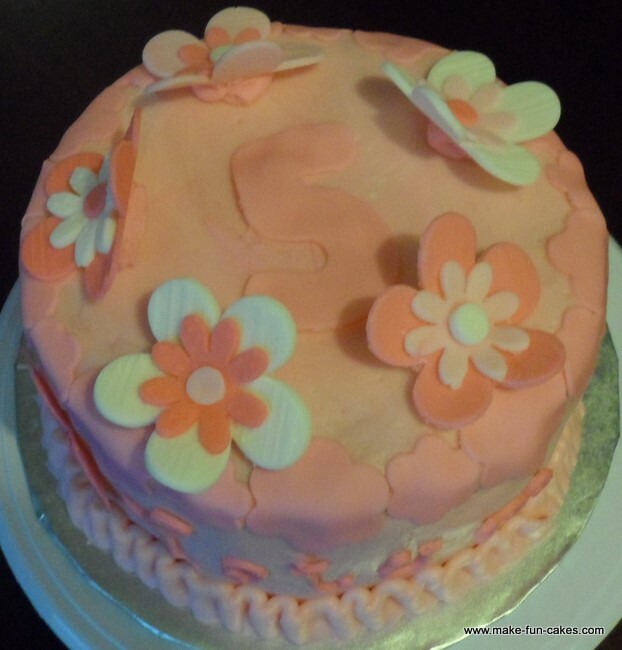 Do not cut the fondant flowers that will border the top of the cake until you are ready to use them. 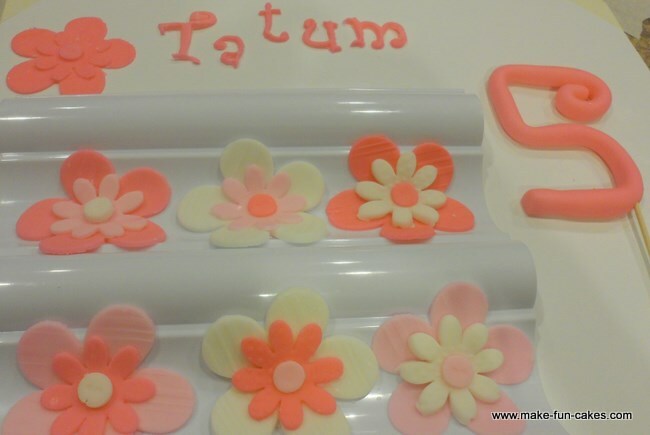 Tint fondant coordinating colors for your flowers. I made three different shades of pink using the color rose. First I added a small amount to my fondant and kneaded it in. I cut several flowers of different sizes and I cut out the number 5. I used Wilton’s mold that cut two different size flowers, plus a round center. 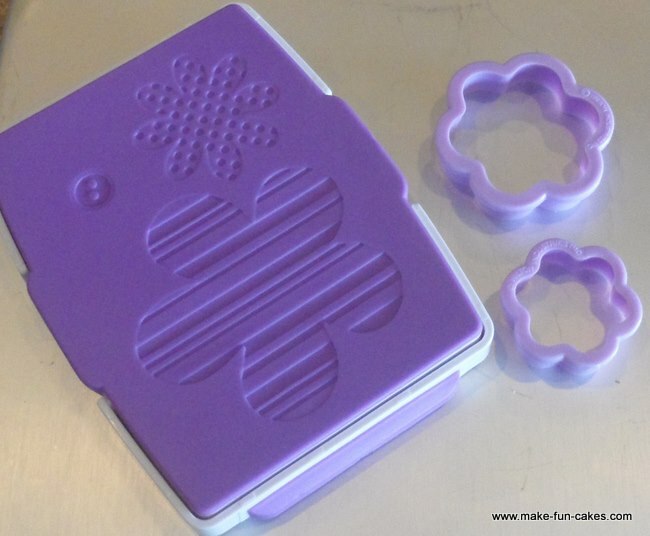 If you do not have this mold you can use any two matching flower cookie cutters of different sizes, plus a round cutter. If you need a smaller circle the size of your fondant cutter, try using Wilton round decorating tip #12 or #10. With the remaining fondant I kneaded in a little more rose color. 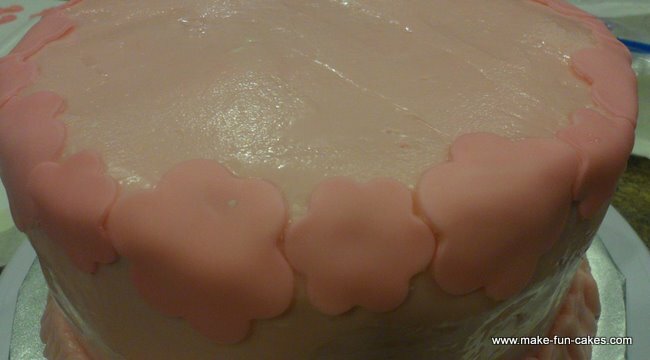 After cutting a few more flowers in different sizes I kneaded a little more rose color into the remaining fondant. I cut the remaining flowers with this fondant. I also cut out the letters to spell the name I was using on the girl birthday cake. Next, I used gum glue to glue my fondant flowers together. Using a brush, paint a small amount of gum glue on the center of the large flower. Place the small flower in the center, off-setting the petals. Finally glue the round circle to the center of the small flower. Place the flower on the flower drying mold, which will give the flower some shape as it dries. Allow these decorations to dry for several days. Bake cake according to recipe directions. Cool, fill and frost the cake. Make a ruffle border on the bottom of the cake. First, using Wilton tip #18 pipe a shell border. 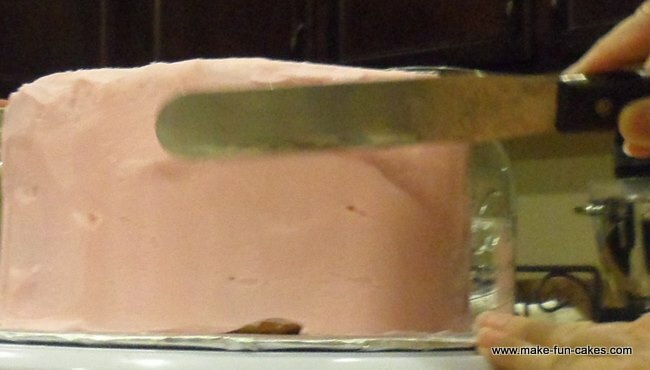 Next, use tip #127 with the narrow end down and the wide end touching the cake. Using an up and down motion, pipe your ruffles. 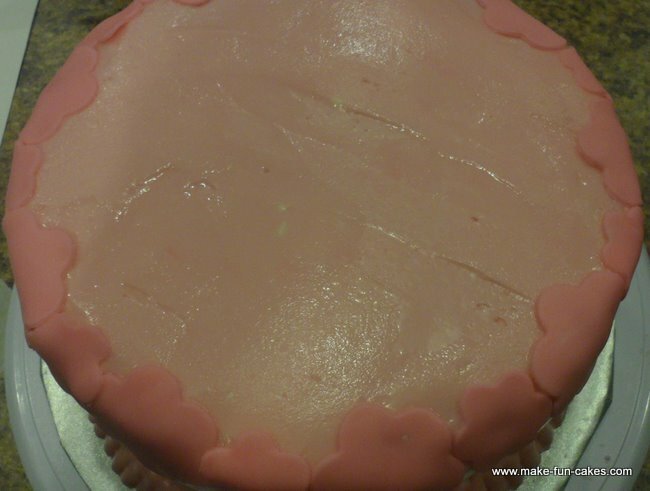 Next, take fondant and tint it the color you want your flower border on the top of the cake. I used two different sized flower cutters. Place the fondant flowers on the top of your flower birthday cake, alternating different flower sizes. If the flowers don’t match up evenly all the way around you can gently squeeze the remaining flower to a smaller size. This works well if there is only a small overlap. If this doesn’t work, you can add another fondant decoration, such as a larger flower with shape that you have dried on the mold. Arrange the letters of the name or birthday message on the front of the birthday cake. Place the fondant 5 in the center of the cake. 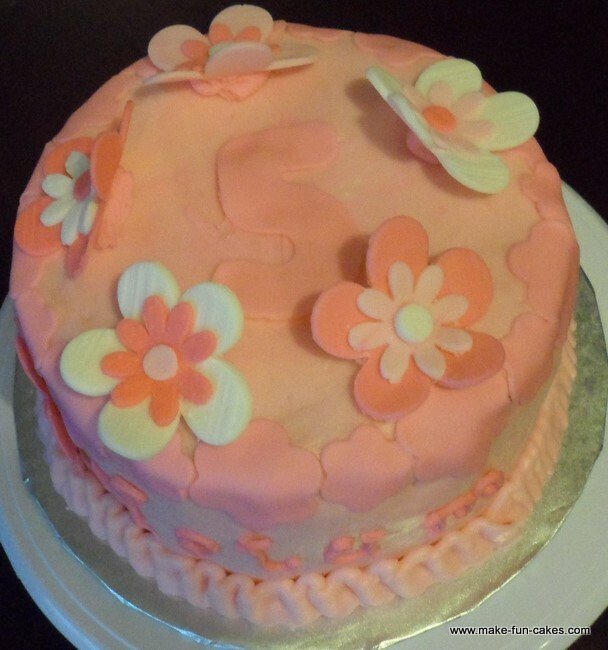 Place the 5 shaped fondant flowers around the number 5. To place a flower on the cake, first pipe a small amount of frosting into a mound and place the flower on top. This secures the flowers to the cake and gives flexibility in positioning the flower. This flower birthday cake looked and tasted great. 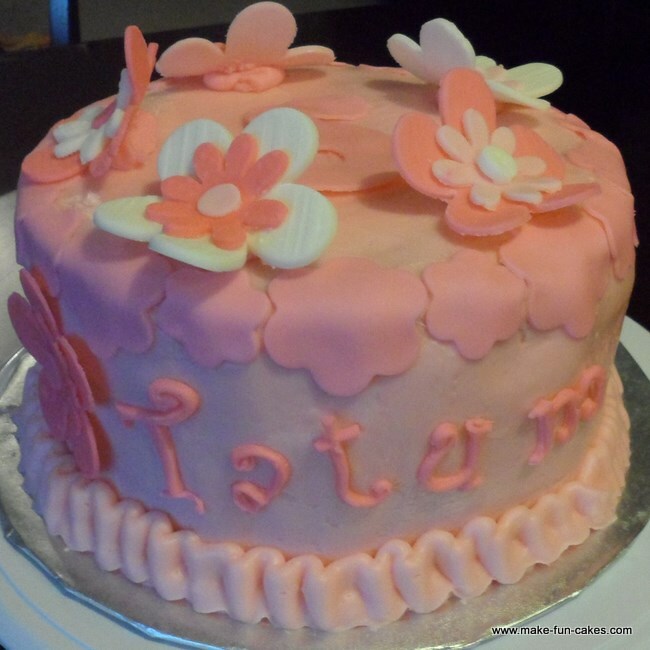 Make your girls birthday cake a flower cake this year! Looking for a different flower birthday cake design? Check out these amazing cakes. Click on the cake picture for free instructions.